The Redemptive Covenant has two stages, the Old Covenant with animal sacrifices, and the New Covenant with one sacrifice provided by the Lord Jesus Christ. The Redemptive Covenant existed from eternity past, operating throughout the time of history, which all the covenants and the dispensations exist. This is the most important covenant where an individual can receive the gift of eternal life in heaven, as a free gift. The only provision accomplished, and given by God, where an individual, when they once receive the LORD Jesus Christ, have their sins forgiven, their past, present and future sins, Romans 5:6-11; Romans 6:23; John 1:12; Romans 10:9-13; I John 5:9-14; Philippians 3:20, I Peter 1:3-4, and Psalms 103. From this time of receiving Christ, the individual is given an eternal relationship with God, they become a transformed child, a child of God, who at that moment is eternally adopted into the eternal sonship of God, bought with the price, the blood of Christ Jesus the Son of God, the one and only incarnate God, who completed the redemptive sacrifice that humanity could not give or provide, Romans 8: 12-17, 9:25-26; 12:1-2, Ephesians 1:5-7, II Corinthians 3:18. The Lord Jesus Christ’s incarnation, John 1:1,14, Matthew 1:21, and His one sacrifice made, the just requirement that God required for forgiveness, and a new relationship; He reconciled individual humans with God and God became reconciled to the individual upon the receiving Jesus as Lord, the one and only savior. Humanity as a whole are children of God’s creation, but they are not a transformed child just because they were born into the human race, or some human work they personally might accomplish through their life. Faith in not ignorance, but trusting in the facts that God has preserved for humanity in His Word, the Bible, and by receiving the truths in repentance, or from anything else you may do in life, Titus 3:4-7, II Corinthians 7:10, Romans 2:4, He accepts you on a personal bases just between Him and you, Romans 10:17, Hebrews 11:1-3, 6; II Peter 1:2-21, II Timothy 3:16-17, Ephesians 2:8-9 Romans 4:6-8; 21-26, I John 5:9-14. Upon receiving the facts or truth, God seals you as His from the moment you receive Him, all the way through physical death, or the day of your physical redemption, and from your transformation of your spiritual life for eternity, Ephesians 1:13-14; 4:30, Psalms 103:17, I Peter 1:3-4. The gospel is the greatest truth for anyone, it’s available for everyone, but only those accepting His provision as theirs, and it ensures the guarantees for salvation, becoming personal, I John 5:12-13. Those who refuse and reject these fact and truths are truly ‘the walking dead’, reaping eternal punitive judgment in the eternal Lake of Fire by a personal rejection of God’s just provision, which He provided in the Lord Jesus Christ, the incarnate second person of the triune Godhead, Revelation 20:7-10, 11-15. See chart on the Redemptive Covenant, and next chapter on the redemptive covenant. 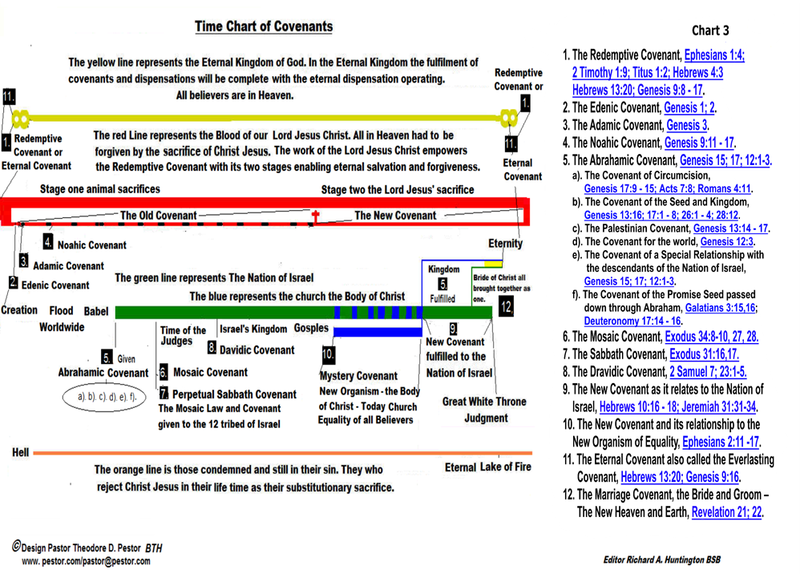 Also, see the basic chart, chart one, on all the administrations (dispensations) that God planned since creation, and follow the red line through the dispensations. The Bible does not specifically state a covenant called the Edenic Covenant, it is not in God’s Word. Possibly a covenant had been inferred in Hosea 6:7, when God created Adam, however it is not clear (the Hebrew word for man is Adam). The Word of God, the Bible does not use the word covenant earlier than Noah. Conceivably a case could be made that there had been a covenant other than the Redemptive Covenant in effect, but none are mentioned until God established His covenant with Noah. The first occurrence of the word covenant in Scripture with to Noah, being a covenant for the earth. In passing, there was another covenant mentioned at this time, called the Everlasting Covenant. The identification of the Everlasting Covenant, also called the Redemptive covenant is found in numerous of places in the Bible. Hebrews 13:20, Genesis 9:8-17. The New Testament brings the prophetic promise of, Genesis 3:15 to fulfillment with the Lord Jesus Christ, connecting His promise is the supremacy of the Redemptive Covenant. The joining the old truths, before Jesus, and after His birth being the second stage of the redemptive Covenant called the New Covenant. This covenant with the two stages was established by the Godhead in eternity past, Hebrews 4:3. Paul verifies the eternal Redemptive Covenant was planned by the Godhead in eternity past, Ephesians 1:4, II Timothy 1:9; Titus 1:2. Genesis contains many inclusive truths of universal value revealed in it, including the creation of time (a 24 hour day), the seven days, and creation with the absolute decree governing nature. All the governing laws of nature (science) not mentioned in Genesis are universal truths working in a dispensation. The universal truths of God are to be categorized under the element or principle of a dispensation. Every dispensation has seven guiding elements or principles that contain many laws. Those parts are the guiding truths relating to the functioning of the economy within a dispensation. The beginning of a dispensation is operating here, even though the word dispensation is not used for the economy in this passage. A dispensation definition will explain and describe the events better, than forcing a covenant definition that is not present in the passage. The seven elements or principles, show the presents of a dispensation, and how it is to be governed, and will be repeated in the future dispensations with the modified and new rules for operating. The Bible does not specifically state a covenant called the Adamic Covenant, it is not in God’s Word. The label is like the Edenic covenant, being a Theological presupposition marker. If dispensations had been understood earlier there would be better consistency today. There are more points reflecting a dispensation rather than a covenant in what has been called the Adamic Covenant. Genesis presents more defined proof of the governing principles within the economy of a dispensation over a covenant appearance. Genesis 3:15 is the covenant of redemption that does appear here, and verified as a covenant from multiple other scripture references, Ephesians 1:4, II Timothy 1:9, Titus 1:2, Hebrews 4:3; 13:20, Genesis 9:16,17. The events of Adam’s sin or fall should be looked upon as part of the makeup of the dispensation, relating to humanity's failure and God's long-suffering. The events from the disobedience that occurred gives the additional three parts, or elements relating to a failed dispensation, the sin, the transition, and the punitive judgment that led into the next dispensation’s economy. Remember the seven principle of a dispensation are: the Universal parts, the New Laws, Modified Laws, the Stewards, the Failure, the Transition, and the Punitive Judgment. The Redemptive Covenant already existed before the creation in the plan God prearrange. God's omniscience in His foreknowledge, love, mercy and grace was in place when sin occurred, and is clearly recorded in His Word. The first prophesied promise of deliverance is in Genesis 3:15. Given during the transition period between the Dispensation of Innocence and Conscience. It is worthy of taking note that God provided a just covering for their sin, and they received it from God by faith. Humanity's religions have never given salvation, the insufficient covering of leaves was represented by the provision Adam and Eve made for themselves, which was not sufficient since it was not a blood sacrifice, Hebrews 9:22. The Old Testament or Covenant, stage one of the Redemptive Covenant became operational with God providing the first animal sacrifice to cover Adam and Eve's sin, being applied in the first transition after the first dispensational failure. It was a blood sacrifice providing a covering over sin, and providing a possible relationship with God that operated until the finished work of the Lord Jesus Christ, and the implementation of the New Covenant at Acts 2. The first dispensation’s transition starts with the sin or the failure of the stewards, and ended with their expulsion from the Garden of Eden. All transitions from one dispensation to the next, shows that the old dispensation is decreasing while the new one is taking over. It is amazing how the change occurs, and does not conflict nor is it contradictory to the truths of God. The understanding of the transitions between them will be able to help the student of Scripture to understand the events occurring between dispensations. The Noahic covenant is the first mention of a covenant. The word covenant appears here in the Biblical text, when God reveals to Noah the covenant that He would never again destroy the whole earth at once with a worldwide flood, cutting off all flesh. God gave the rainbow as a sign of the covenant that included the Redemptive Covenant referred to as the Everlasting Covenant. Whenever the rainbow appeared it reminds Him of the Redemptive Covenant, it and was to give humanity security as they remembered the promises, whenever they see the rainbow, John 3:16; II Peter 3:9; Romans 2:4; 5:8; 8:38,39. However, the first part of Genesis 9, verses 1-7 is dispensational, and not part of the redemptive covenant or a covenant. It is setting out the dispensational rules, with the modifications from the former rules of the previous dispensation, and stating some of the universal rules and laws. There was occurring a change, a transition between the former dispensation, starting at the failure recorded in Genesis 8, where the stewardship for the next dispensation was given to Noah and his descendants, for the Dispensation of Human Government. Universal rules: humanity is created in the image of God, capable of reproduction, animals are still animals, all still need food for sustenance and blood still flows within the life of humanity and animals. Rules Modified: Humanity now can eat meat along with herbs, animals would have an instinctive fear of humanity, and humanity would have the rule over the livelihood of animals. New Rules not before given: The dispensational rules established, humanity governing as an institution of government. When eating meat humanity was to consume it without the blood in it. The murder of any living animal or human, now would be judged by humanity. Instituted was Capital punishment as the penalty for murder, and was to be carried out by a human instituted. The Abrahamic Covenant had incorporated additional covenants that were given along with the Redemptive Covenant passing forward to future generations. When studying the covenants the question needs asking which covenant is the Word of God speaking. When studying the Bible, ask, is this passage referring to a singular covenant or plural covenants. Examples: (Plural covenants) - Romans 9:4, Galatians 3:17, Galatians 4:24 , Ephesians 2:12, (Singular covenant) - Romans 11:27, I Corinthians 11:25, II Corinthians 3:6, etc. A. One of six, the Covenant of Circumcision - The Seal of the "Special Eternal Relationship" was the circumcision of the Jewish male child, Genesis 17:9-15, Acts 7:8, Romans 4:11, and any gentile accepting the God of Abraham was required to be circumcised obeying the Covenant Seal as given in the Dispensation of Promise, Exodus 20-31 and Leviticus, Deuteronomy 17. B. Two, the Covenant given to Abraham, his seed & kingdom – There would be a great number of descendants, Spiritual seed and natural seed, Genesis 13:16, 17:1-8, 26:1-4, 28:12, given through Abraham and Sarah, Genesis 17:19, then Isaac, Genesis 26:2-4, and Jacob, Genesis 28:12. C. The third, the Covenant of the 'Promise Seed' passed down through Abraham, Galatians 3:15, 16; Deuteronomy 17:14-16; I Samuel 8. Including, the Earthly Kingdom through David, Christ will rule on this earth, I Chronicles 17:4-15. D. Forth, the Palestinian Covenant - Land deeded eternally to Abraham’s descendants, Genesis 13:14 - 17. Dispensational (A Modified rule for a uninterrupted possession) they had both a conditional relationship to the land, Deuteronomy 30:1-10, and an unconditional relationship to the land, Leviticus 26:44, 45, Psalms 89:30-37. E. Fifth, the covenant contained a "unique eternal relationship" for the world. Carrying out the covenant by both the gentiles and the Jewish Nation was a dispensational responsibility. The dispensational law was based on the treatment by the gentiles on the descendants of the Abrahamic Covenant. The world was to spiritually accept God through Israel's example. The covenant commanded that Abraham and his descendants were also to be a blessing to the gentile world, Gen. 12:3, “And so you shall be a blessing; and I will bless those who bless you, and the one who curses you I will curse. And in you all the families of the earth shall be blessed." F. The sixth, the covenant of a Special Eternal Relationship for the descendants of the Nation of Israel, Genesis 15; 17; 12:1-3. The Mosaic Covenant was given to Moses who God used to write the first five books of the Bible, also referred to as the Torah. Moses was from the Jewish Nation, and God used Moses to preserve the history for humanity through this recording by shrinking the recorded history of the prior dispensations. He outlined the events of the first three dispensations, Innocence, Conscience, Human Government, and the beginning of the Dispensation of Promise that occurred before his birth. God not elaborating on the first three dispensations, but instead revealed enough for humanity so they would have a record of the prior events. He detailed the event with Israel, and the giving of the Law called the Law of Moses. God worked with him through his life elaborating on many new events for Israel in detail for the Dispensation of Promise. God gave Israel a special privilege in preserving history. However, Moses recorded God's disappointment with the Israelites for their lack of obedience and knowledge of His working, Romans 3:1- 2. When studying the covenants and dispensations, Christians can and should connect with the disappointment God has with us when we willfully commit the same sins the Nation of Israel committed, and repent, drawing on the power of indwelling Holy Spirit for victory over sin, Proverbs 20:27; Ephesians 1:13; Romans 8:12-17; John 14:15-18, 25-30. The Mosaic covenant is not one of the previous covenants that had already been established with Abraham and already operational with his descendants, Deuteronomy 5:1-5; Exodus 6:2-4, Galatians 3:17-18, Galatians 4:21-26. The Mosaic Covenant given relates to the Israelites rebellion after coming out of Egypt. The Mosaic Covenant, Exodus 34:8-10, 27-28, was given at Mount Sinai at the time when God was ready to destroy Israel for their Idolatrous worship. God offered to work His future plan through Moses in place of the Israelites who came out of Egypt, but Moses interceded for them, Exodus 32:9-11, Exodus 34:8-9. Moses knew God was greater than Israel's sin, and appealed to God and His mighty works. Christians can go to God knowing He is greater than the problems in their lives even today, Hebrew 4:11- 13; I John 5:13-14. The writing of the Mosaic Covenant was given with the Ten Commandments. Moses meeting with God, seeing and experiencing the rebellious Israelites when descending from the mountain, God was ready to destroy all of them. Moses interceded for them Exodus 32:11-13, by communicating with God, challenging Him for His namesake, and connecting Israel’s deliverance from Egypt as God’s glory, and destroying them could possibly cause the non-believing nations around to mock Him. The Mosaic covenant was God’s commitment to Moses to continue His work through the Jewish people who had come out of Egypt. Today the Holy Spirit intercedes for Christians convicting, and speaking to the Godhead when they are confused, and uniquely He works at times for believer when they do not know what to ask, or how to express themselves, Romans 8:1-17. The Mosaic Covenant was God’s choosing to continue working through the descendants who came out of Egypt instead of God destroying them and starting over with Moses, Leviticus 26:40-46. Alongside of this covenant there was a sign covenant given called "the Perpetual Sabbath Covenant" and it was given as a reminder covenant of whom Jehovah was, (The ‘I Am’ to the Israelites), Exodus 31:16-17. The Israelites were worthy of destruction, but God using that occasion brought the laws to the world, Romans 3:1-2. The purpose of the Ten Commandments contained in the Law of Moses was to reveal the sinfulness of man’s heart. The total law was custodial until Jesus Christ, Galatians 3:19-21. Even the Law was not for Israel's salvation without faith, for faith was a prerequisite, Romans 9:30-33. (Note however, the adults who came out of Egypt, excluding Caleb and Joshua all died for their continuous unbelief in the wilderness, and the promise was given to their children, who entered the Promised Land, Hebrews 3:16-19; Numbers 26:65). The Mosaic Covenant is identified with the giving of the Laws, which was given to Moses and at times can be confusing, Hebrews 9:1-5. The laws were not the covenant, but gives the dispensation’s governmental rules for Israel's economy in carrying out the covenant. Both the Mosaic Covenant and Law of Moses were added to the Dispensation of Promise for Israel and the world to obey at this specific time, Galatians 3:17. Contained in the Mosaic Law were principles that either where carry over laws from earlier dispensations, or modified laws from the former dispensations. It also, had new laws for the new dispensation of Promise coming into its fullness, with the universal laws from the former dispensations. The Law of Moses given to the world was only a temporal guardian that brought Israel and the world to the events that eventually came about, with the New Covenant becoming operational, Galatians 3:19-25. The laws in the Law of Moses were the rules for carrying out the Mosaic Covenant in the economy of the Dispensation of Promise. Contained in this temporal guardian, specific moral universal laws were spelled out for humanity's obedience, (the Ten Commandments). The New Covenant to the world, Romans 9:4-5. The Perpetual Covenant of the Sabbath made at Mount Sinai was a sign for the Nation of Israel to remember that the LORD is the ‘I AM,’ who sanctified them, Exodus 31:12-17. This covenant is a sign for Israel, forever calling them to remember their deliverance from Egypt by Jehovah. This covenant to Israel was incorporated into the universal law of rest. It was originally given at creation, and now it relates to the name, ‘I AM,’ who delivered Israel from Egypt. A day of rest is a universal truth given at creation, and though the dispensations, Christians, are not under a Sabbath performance of this covenant, (A specific day of the week). Christians are commanded to worship and encourage fellow believers in their pursuit of sanctification every seventh day, Hebrews 10:25; Colossians 2:16; Genesis 1:31-2:1-3. When studying the modified rules of a dispensation, change is seen for the seventh day of rest; today it is a willful act of observance for believers and not given as a covenant. It's a universal principle of a day of rest from work taken from creation, not a calendar day. The commandment given in the Ten Commandments call it a Sabbath day or seventh day from work, (The origin of the word Sabbath is derived from the verb sabat, meaning to stop, to cease, or to keep). This sabbath covenant of Exodus 31:16-17 was given to the Nation of Israel as stated in the Dispensation of Promise as a perpetual rule, and Israel's covenant was for them to remember the great ‘I AM,’ on a specific calendar day, the day they were delivered from captivity and slavery in Egypt. The specific day of the calendar is a specific dispensational rule for the Dispensation of Promise, Israel had more than one Sabbath, having several according to the calendar that were not covenants, but a dispensational observance, Leviticus 16:29-34; 23:23-44; 25:1-8; II Chronicles 2:4. The Perpetual Sabbath Covenant relates only to the Nation of Israel, and not the rest of the world. Should the Nation of Israel observe this covenant in this dispensation? Read: Acts 15 and Exodus 31:12-17. If observed by the Nation of Israel they need to commemorate it in the simplest form as given to Moses. Why commemorate? It is for the Jewish Nation, God’s Word says it is an added reminder of their deliverance from Egypt forever. The Nation of Israel has a future dispensation, where many of the Jewish Laws will be reestablished under Jesus' Messianic Reign, when the Dispensation of the Kingdom is established on earth, these laws and covenants will be a memorial of the finished work of Christ. The Davidic Covenant was given to David who was an Israelite King, during the Dispensation of Promise. The covenant states that the Nation of Israel would have a King from David’s descendants, and He will rule the Nation of Israel and the world. The literal fulfillment of this Covenant with the Nation of Israel will be in the Messiah presence, here on earth, the second coming of the Lord Jesus Christ (the Messiah), Hebrews 1:8, 8:7-12. Historically, His incarnation in the Dispensation of Promise was the fulfillment of the Godhead's plan for empowering the redemptive payment, Galatians 4:4, not just the authorized Messiah, but with the one sacrifice which could meet the just payment needed for the redemption of humanity, Hebrews 9:11-15. Empowering for eternity, the Redemptive Covenant gave the Davidic Covenant fulfillment of the prophesied descendant, with its authorized King or Messiah, Hebrews 9:12. The Davidic Covenant will find fulfillment or completion in the Dispensation of the Kingdom. The fulfillment of His earthly rule on this old earth, begins His eternal rule in the Dispensation of the Fullness of Time, establishing the new heaven and earth, Revelation 20:6; Revelation 11:15, Ephesians 1:10. Today, He is King, Messiah of humanity, we're under His heavenly authority, though He is not physically present here on earth, Ephesians 1:20-23. Believers today are responsible to carry out the economy according to the Mystery dispensation of Equality, Ephesians 3; II Corinthians 5: 17-23. The Holy Spirit is residing within believers' physical bodies, operating to fulfill the promises of the New Covenant to those who are His, making them ambassadors to the world. God purchased believers by the crucifixion and resurrection, and makes His presence in each believer's body, calling it His Temple, I Corinthians 6:19-20. (The transformed believers' responsability, Romans 12:1-2; II Corinthians 3:18; Romans 10:9-13; I John 5:9-14). The Church, meaning, the called out believers of today are called His Body, Ephesians 1:22-23. We need to mention one more thing which needs to be said, and hopefully it will encourage others to do His will, and seek the truths found within a dispensational understanding of God's plan and work. David was a man after God's own heart and God recorded this fact about him in, Acts 13:20-24. Today God wants to locate and educate faithful teachers and laymen in our world! Will He find men and women after His own heart, II Timothy 2:2? The old covenant to the Nation of Israel, referred to in the book of Hebrews, is the Mosaic Covenant, Exodus 34:8-10, 27-28. The ‘new’ refers to the New Covenant as it related to the Nation of Israel's promises, and the redemption fulfilling his promise for Israel. God promised He would make a new covenant unique the Nation, Jeremiah 31:31. The New Covenant for Israel is in addition to the other covenants promised, and already given that will be fulfilled in the last dispensation. The book of Hebrews gives hope of the continuation of the original promises under the New Covenant, and validates or authenticates all the other covenants promised to Israel. In Hebrews 8:7-12, a new covenant was given to the Nation of Israel, the Mosaic Covenant that was temporal until Christ, the Messiah, and promises to Israel are now incorporated into the second stage of the Redemptive Covenant, Hebrews 9:15. The second stage of the Redemptive Covenant is the New Covenant that many get confused with the Mosaic Covenant. The passages in the book of Hebrews, with its terminology are referring to the Mosaic Covenant many times, and how it relates to aspect of the New Covenant, it is not the first stage of the redemptive covenant that was implemented back in Genesis, and planned in eternity past. Redemption is the other important aspect that relates to the fulfillment of redemption for the Nation of Israel, Hebrews 10:16-18, Jeremiah 31:31–34. Israel as a Nation will find the completion of their redemption promises in the Millennium, and finally completing in eternity Romans 11. The covenant spoken of in the book of Hebrews was passing away in reference to the Mosaic Covenant, not the Redemptive Covenant’s existence. It is showing how Stage one of the Redemptive Covenant is complete, along with the passing away of the Mosaic Covenant. The Hebrew writer does refer to the fulfilled prophecies to Israel as a Nation, and the Mosaic Covenant being incorporated into the New Covenant of Redemption. All the promises to the Nation of Israel that existed, and was found in the Abrahamic and Davidic Covenants come to a final fulfillment in the last two future dispensations, II Corinthians 3:7-18. However, when the Nation of Israel who were supposedly to take up the responsibility, refused to take up the offer given to be the stewards, as seen in the passages of Acts 1-7, and the stewardship being given to another, under a new dispensation, Act 28:28. This new dispensation was hidden in prior dispensations, and not prophesied, the Word of God calls it "a mystery not before revealed," Ephesians 3; Romans 16:25-27; Colossians 1:24-29. Christ Jesus is better than Moses, the receiver of the 'old Covenant,' given through Moses to the 12 tribes of Israel who came out of Egypt. The book of Hebrews is comparing the covenant of Moses and redemption given to Israel by Jesus Christ. A new covenant to Israel incorporated into the New Covenant of redemption the second stage of the redemptive covenant, also called the everlasting covenant. Today, relationship to the better covenant given specifically to the Nation of Israel, for them to be right before God, they need to accept or receive Jesus, as the Lord Jesus Christ (the Messiah). The Hebrew writer is comparing a rest for Israel, better than that given by Joshua. The rest of the Lord Jesus Christ, one receives not from personal labor, but from what Christ Jesus gives freely. Even believers today under the Dispensation of Grace, knows that our rest only comes as a free gift, apart from anything we can do for ourselves, God transforms believers through the works Jesus Christ accomplished, no personal works can make us righteous before God. However, as a transformed believer our rest is experienced, as we live by the truths in conformity with God’s word, Ephesians 2:10, Romans 12:1-2, John 2:1-3. The covenant that the book of Hebrews is addressing is a guaranteed covenant of better things than the Mosaic Covenant, with its priestly heritage. It is not comparing the Redemptive Covenant of the Dispensations before, but a specific aspect, containing the Levitical priesthood. It may be worth taking note that the prophetic passage, and this particular passage is referring to a priesthood before Abraham and the Mosaic Covenant, Genesis 14:18-20; Psalms 110:4. We see Melchizedek in the transition period from the Dispensation of Human Government and the Dispensation of Promise. His identity was not revealed in Scriptures from previous dispensations, and used here as an illustration of a priesthood, without beginning or end, and used to illustrate the deity of Christ Jesus, the only priest forever, bringing the better covenant. "But now He has obtained a more excellent ministry, inasmuch as He is also Mediator of a better covenant, which was established on better promises. For if that first covenant had been faultless, then no place would have been sought for a second. Because finding fault with them, He says: “Behold, the days are coming, says the Lord, when I will make a new covenant with the house of Israel and with the house of Judah - not according to the covenant that I made with their fathers in the day when I took them by the hand to lead them out of the land of Egypt; because they did not continue in My covenant, and I disregarded them, says the Lord. For this is the covenant that I will make with the house of Israel after those days, says the Lord: I will put My laws in their mind and write them on their hearts; and I will be their God, and they shall be My people. None of them shall teach his neighbor, and none his brother, saying, ‘Know the Lord,’ for all shall know Me, from the least of them to the greatest of them. For I will be merciful to their unrighteousness, and their sins and their lawless deeds I will remember no more.” In that He says, “A new covenant,” He has made the first obsolete. Now what is becoming obsolete and growing old is ready to vanish away." This passage says, “not according to --- made with their fathers --- in the day to lead them out of Egypt,” the scripture directly connect this passage when God took them out of Egypt not the Abraham covenats, or Eden prophecy of the incarnation of the Lord God, Genesis 3:15. This passage also prophesies to a future when Israel will know the Lord, referring to the future dispensation of the earthly Kingdom, when the Lord Jesus Christ will be present here on earth, Romans 11:25-27. Also, it is explaining that this relationship will be after the New Covenant is in operation, and the old Mosaic covenant has ended, in fact because of Christ Jesus with the New Covenant, being the mediator, the covenant was completed, therefore the old covenant was passing away, I Timothy 2:5. The writer of Hebrews is not saying the Redemptive Covenant planned in eternity past had earthly services, and an earthly sanctuary, but it is referring to the Mosaic Covenant that did; the Aaronic priesthood, the tables of the Mosaic Covenant, the Ark and the manna all relate to the covenant given to Moses, not the Redemptive Covenant that was implemented back in Genesis one, during the dispensation of Innocence. Also, contrast it to the previous chapter 8:13, where it says the covenant spoken as old is passing away, and is vanishing; the Redemptive Covenant God’s plan does not pass away or vanish, having an eternal fulfillment from eternity past to eternity future. Again showing the passage is speaking of the Mosaic covenant after he received the covenant from God, and implemented after Mount Sinai. Hebrews 9:15 "And for this reason He is the Mediator of the new covenant, by means of death, for the redemption of the transgressions under the first covenant that those who are called may receive the promise of the eternal inheritance." The LORD Jesus Christ (Israel’s Messiah, who is King of the world) is the mediator of this Eternal or Redemptive Covenant, and how his mediation forgives all, those who were under the Mosaic Covenant, so the promises of Israel’s inheritance could be given to them. This passage is speaking the truth of Christ Jesus being mediator directly to the Nation of Israel, and He is also shown by the Apostle Paul to be the Mediator for the Dispensation of Grace. Christ's mediation office is for all who are sons of God in His redemptive plan, ever since Adam and Eve, for there is no other equal, I Timothy 2:5, Romans 5. "Therefore, not even the first covenant was dedicated without blood"
Romans 3:25-31; 5:6-11; Ephesians 1:7; 2, shows the importance of the blood of Christ in relationship to redemption, and the empowering of the New Covenant for all dispensations and covenants. Hebrews 9:16-28, show the connection with the Mosaic Covenant, also called the old covenant received at Mount Sinai. Chapter 10 is full of exhortation of encouragement to all Jewish people given promises to their Nation for those who accept the Lord Jesus Christ as the one who will fulfill the promises made to them. Chapter 11-13 exhorts that the Lord Jesus Christ is the power, and plan God has promised before Moses, promised for all the saints’ the hope found in Jesus. The examples go back all the way to the first dispensation of Scripture for those looking for the redemption of humanity that is in Christ, those who will receive salvation and the eternal kingdom. The Nation of Israel will be stewards of the earthly kingdom, Revelation 5:10; Exodus 19:6, and reign here on earth as priests with the Lord Jesus Christ, I Peter 2:4 -11; Revelation 1:6; 5:10; 20:6. In Acts the Nation had rejected their commission. However, in the future dispensation of the earthly Kingdom, they will once again be the primary stewards of God’s rule, (kings and priest). Their leadership will begin again in the prophesied transition of the seven years tribulation, and find fulfillment in the millennial reign of Christ. Through the Book of Revelation, which expounds the transition into the Dispensation of the Kingdom, the Nation of Israel is implored to have their conduct honorable, living before other nations in preparation of setting up His Kingdom, on the present earth, Revelation 1:5-6, 10, 20; 2:2, 9, 14, 20, 24-28; 3:4,7- 9, 21. Revelation 20:4-6, the saints who will be martyred in the tribulation will be priests of God and of Christ, and will reign with him for a thousand years; Revelation 2:7, 8-11, 17, 25-29; 3:4-6, 7-13, 20-22. Revelation 21:24, and the nations of those who are saved will walk in its light, and the kings of the earth will bring glory and honor as they appear before the Lord in the New Jerusalem. Today's dispensation believers are equally special to God, Titus 2:14, but the Nation of Israel does hold a relationship that is unique to them because of the promises to Abraham, Romans 9:22-33; 11:1-27. Today our relationship to Israel’s promises and covenant are spiritually experienced through faith, in the finished work of our Lord Jesus Christ, according to the Dispensation of Grace that was a mystery of full equality. The fulfillment of the promises and covenant to us will be after the Rapture in our spiritual bodies, Ephesians 2:11-13; I Thessalonians 5:6; II Thessalonians 2:6; I Corinthians 6:2-4. The universal principle, of "faith towards God" and "blessings of obedience" never change, and all humanity is accountable no matter what dispensation they live or had lived. Individual Jews living today are responsible to live according to the Dispensational economy of equality, and when the Rapture occurs the believing Jews will be raptured also, ending the Dispensation of Grace as the world goes into the punitive judgment of the tribulation period. After the Rapture, our Lord will save anyone who receives Him as Lord and Savior, both Jew and Gentile, and the believing Jews, who at this period, will be the stewards of God’s program going through the transition, and into the Kingdom on earth, The Dispensation of the Kingdom. 10. The New Covenant, Relationship with the One New Organism of Equality - (Ephesians 2:12-13, 14-17); Ephesians 3:2. The connection to the New Covenant is scriptural, and reveal the connections with the promises of the former economy that became applicable to the New Organism, called the Body of Christ, the church today, in the Dispensation of Grace. The New Covenant, being the Redemptive Covenant also called, the Everlasting Covenant brought this relationship about, Ephesians 2:12-13, 14-17. First: This covenant shows that God planned before Abraham, Noah, Eve and Adam that salvation would be offered equally to the world, Romans 1:16; 3:21-26; Colossians 3:10-12; Galatians 3:28. Second: The covenant made in eternity past would save those who believed, readily accepting the provision of the New Covenant or Redemptive Covenant, I John 5:9-14; Romans 10:9-13; John 3:16; 1:11-12; Ephesians 1:13-14; 2:8-9. Third: Ever since the Covenant of Redemption, all who would receive the opportunity, have eternal life, II Peter 3:9-16. Fourth: Today's covenant was not non-existent, but contained in the covenant made in eternity passed, but now revealed in the Dispensation of Grace, Ephesians 1:4; II Timothy 1:9; Titus 1:2; Hebrews 4:3. The truths given to the Apostle Paul stating it was a mystery hid in God, now becomes clear to all on an equal bases when comprehending dispensations, and the connection of carrying out God's covenant to humanity, Romans 16:25; Ephesians 3:9 Colossians 1:24-29! Fifth: This covenant is part of the existing covenants with Israel, Ephesians 2:12-13. The Redemptive Covenant is the most important relationship followed by the spiritual connection to the commonwealth of Israel, and the relationship to the promises. Sixth: This covenant brings together all thing in heaven and earth, made by God for this purpose, Ephesians 1:6, 10-11. Seventh: It was not given because anyone deserved it, but because of His Love, Ephesians 2:1-5. Eighth: An inheritance was obtained, Ephesians 1:11. Today a believer is part of the Kingdom of God and no longer a stranger, but is made alive, who formally had no part, Ephesians 2:1-5. Ninth: All believers are partakers of His promises through this same Body (The name ‘body’ given to all the saints since the beginning of time. ), and heirs together with all the saints, Ephesians 2:16-22; Ephesians 3:6, (Ephesians 2:19, “you are no longer strangers and foreigners, but fellow citizens with the saints and members of the household of God."). Tenth: No longer strangers or foreigners, but fellow citizens of the Kingdom of God, Ephesians 3:1-9. Eleventh: The Body, the church today joined, and knit together of believers, Ephesians 4:16. Twelfth: There is neither Greek nor Jew, circumcised nor uncircumcised, barbarian, male or female, slave nor free, but Christ is all and in all believers, Colossians 3: 10-11, Galatians 3:28. Thirteenth: The Gospel is not to bring shame because it is the power of God, it brings salvation to everyone who believes: the Jews where first, and now the Gentile, Romans 1:16. Fourteenth: All sinners are equally guilty, Romans 3:9. Fifteenth: This righteousness is given through faith in Jesus Christ to all who believe. There is no difference between Jew and Gentile, Romans 3:22. Sixteenth: Both Jews and Gentiles are equal in Christ, Romans 3:29, Romans 9:24, Romans 10:12, I Corinthians 1:24. The Eternal Covenant runs from Eternity passed, through the existence of humanity on earth, and into Eternity of the New Heaven and Earth, also known as the Redemptive Covenant. It empowers salvation by the Holy Spirit’s working on humanity, and upon personal acceptance by faith, received by one’s cognitive response of faith according to the recorded Word of Word, Romans 1:17; 10:17; I John 5:9-14 and the Holy Spirit’s working, Romans 8:26-30; 10:9-13, Ephesians 1:13. A.) The Word of God reveals the Eternal Covenant existed and planned by the Godhead in eternity past. The Eternal Covenant started redemption for believers with God's foreknowledge plan, and before it was needed, prior to the creation of the heavens and earth, Hebrews 13:20; Genesis 9:8-17; Ephesians 1:4; II Timothy 1:9; Titus 1:2; Hebrews 4:3. B.) The Eternal Covenant was at work in the first three dispensations Romans 1:20, Romans 2:12-16: The Dispensation of Innocence Genesis 3:15, 21. The Dispensation of Conscience, Genesis 4:4, Luke 11:49-51, Hebrews 11:4, 12:23-24, Genesis 6:9, Hebrews 11:7. The Dispensation of Human Government Genesis 14:18, Exodus 3:1, Genesis 11:27-32, II Peter 2:5-7, Genesis 9:12-17. The Eternal Covenant came through Seth's descendants, Shem's descendants and then Abraham, at least 2000 plus years, after Shem, Luke 3:23-38. C.) The covenants and promises connection with the Eternal Covenant guarantees to Abraham fulfillment. His earthly descendant the savior came through the Nation of Israel, the promised Deliverer for humanity, Genesis 3:15. The Savior came through Abraham’s line, Judah which would be a blessing to the whole earth, and from the effects of sin, bringing reconciliation by God as prophesied, Genesis 49:10, I Samuel 17:12, II Samuel 7:12, II Kings 8:19, Matthew 2:6, Hebrews 7:14, Hebrews 8:8, Revelation 7:5, Revelation 22:12-16. Genesis 17:7, 19, The guarantees extended to the Covenant promises God made with Abraham as everlasting. Genesis 12:1-3, Blessings would affect the whole earth, because of the One eternal covenant, the Seed that contained and empowered the promises of the covenant, Galatians 3:5-16, 5-9, 22, 26-29; John 3:10-14. Genesis 17:11, 13, Circumcision was given as an everlasting sign in the flesh, for Israel within the covenant to Abraham. Genesis 17:8, Land deeded, promised by God through the Abrahamic Covenant to the Nation of Israel, for an everlasting possession, and was, and is, guaranteed by the Eternal Covenant's completion. D.) The Eternal Covenant, and the connection guarantees the Dispensation of Grace, eternal salvation: Ephesians 2:12-13, Ephesians 1:6, 10-11. The Eternal Covenant, the New Heaven, New Earth and New Jerusalem, God’s Holy city, is fulfilled in the Bride of the Lamb’s marriage. The Bride is not an exclusive to the Dispensation of Grace. The Church called His Body, is part of the universal family of God. Very clearly the Word of God says the holy city Jerusalem, from above is the mother of all the redeemed, Galatians 4:26, the city of God, Psalms 46:4; 48:1, 8; Hebrews 12:22; Revelation 3:12; 21:2, 10, 23; 22:19. All the inhabitants will be the redeemed, transformed by the work of the Lord Jesus Christ. The marriage feast of the Lamb is when Heaven and earth become one with the Godhead. When all believers who were redeemed unite together under the Lamb, celebrating the eternal state, Revelations 22:16-17, Matthew 25:10, Matthew 22:1-14. The description of the city, the New Jerusalem, filled with the saints of all dispensations, defined as being adorned as the Bride of Christ, Revelation 21:2, 9-10. The Bride of Christ is the Holy City coming down from Heaven, and uniting with humanity on the New Earth, Revelation 21:10-11. God joins with humanity in the marriage of the New Jerusalem, and the New Earth. The New Jerusalem is the Tabernacle of God’s abode, Revelation 21:3; Isaiah 33:20; Amos 9:11; Acts 15:16; Hebrews 8:2; Revelation 15:5; Psalm 15:1; Psalm 43:3; Psalm 46:4; Psalm 61:4; Isaiah 4:6; Isaiah 16:5. When this marriage is consummated, there will be no more death, sorrow or crying or pain, God wipes away all negative tears, Revelation 21:4-5. At that time God sits on His throne in the New Jerusalem, and He makes all things new. Satan, fallen Angels, sin, evil, and the nonbelievers are in the Lake of Fire, this is right after the Great White Throne Judgment, Revelation 21:6-8 cf. Relation 20. The New Jerusalem and the Bride is described in, Revelation 21:9-21. The city is about fourteen hundred miles square. It is described in Scripture as the city of God, Psalm 46:4, Psalm 48:1, Hebrews 12:22, Revelation 3:12. This great city, is holy, and contains pure gold, like clear glass, Revelation 21:18, 21. God is Her light and it contains the most precious stones, jasper stone, as clear crystal, Revelation 21:11; 22:1. A great and high wall with twelve gates (twelve angels at the gates), (three gates on the east, three gates on the north, three gates on the south, and three gates on the west) - names written on them of the twelve tribes of the children of Israel, Revelation 21:12,21. The streets of the city are composed of pure gold, like transparent glass. The twelve gates have twelve pearls - each individual gate was one pearl, Revelation 21:21. The wall of the city has twelve foundations (on the foundations these are the names of the twelve apostles of the Lamb), measure the city (laid out as a square) - its length, breadth, and height are equal, (twelve thousand furlongs, [approximately 1380 miles]) the wall: one hundred and forty-four cubits, (approximately 216 feet), (construction of its wall was of jasper). The foundations of the wall were adorned with all kinds of precious stones, and on the foundation was the name of the 12 Apostles, Revelation 21:14. The twelfth is amethyst, Revelation 21:20. Charts are on a donation bases of $3.50 each deferring the publishing cost. This donation will help others to receive a chart in which they cannot afford.